Lydia will provide you with everything you need to make either a Bear or Hare. The table will be packed with a choice of merino wool, felting needles and sponges, thread and beads for the eyes plus cakes, tea and coffee and a light lunch too! 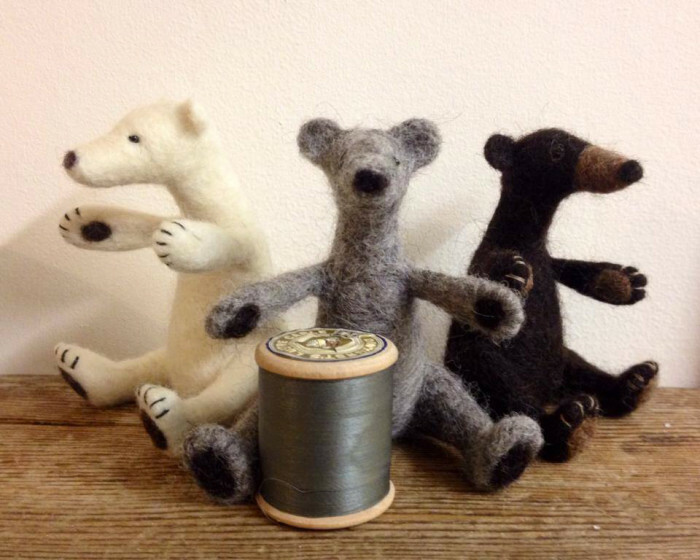 You will be guided every sep of the way as Lydia takes you through the needle felting process and she will be on hand to show you all the tips and tricks of the trade. This special workshop costs £50 and takes place on Saturday 27th September and runs from 10:00 til 16:00. At the end of the day you get to take your fluffy creation home together with the skills needed to go on and make more gorgeous Bares and Hares. You can book here or call Emma for more information. There will be an opportunity to buy additional needle felting kits should you get the bug and on November 21st we will be hosting a reindeer needle felting course in time for christmas. Places are limited so please book here to secure your place.